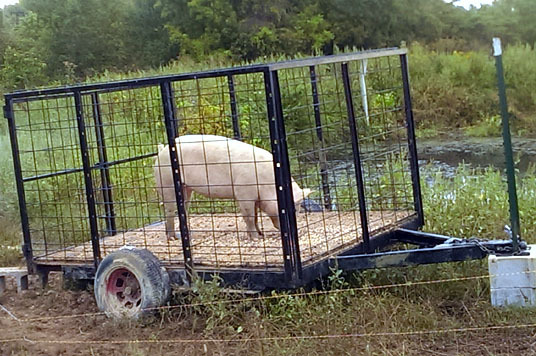 We found ourselves in need of a small stock trailer years ago so Boone built the sides and gate for this little 8×6 trailer that we use for hauling sheep, pigs, and calves. It has paid for itself multiple times over. 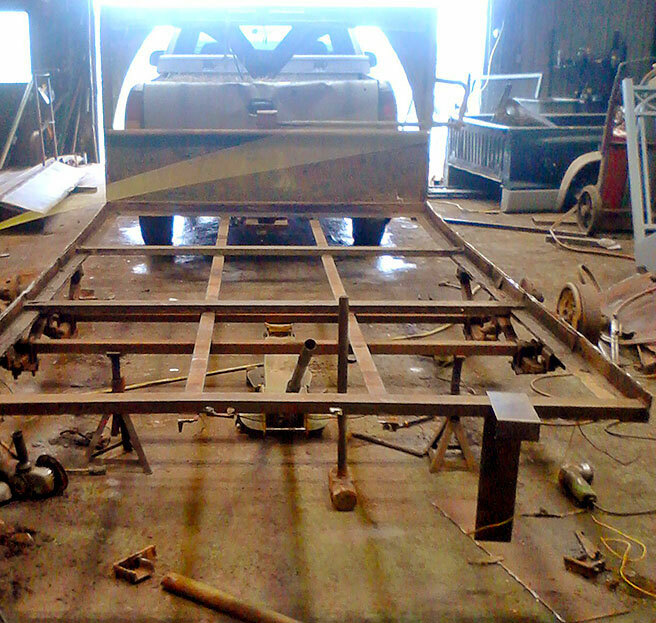 The frame cost $75 and with the cattle panels, rubber mat and wiring we might have $150.00 in it. 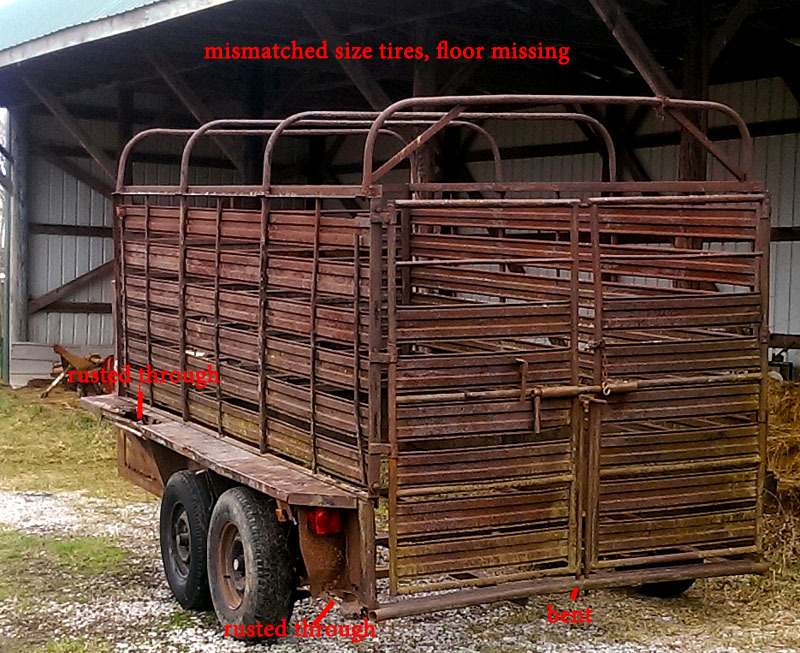 The little trailer works great but when we need to haul cattle we have to borrow a larger trailer from one of our friends so we are always on the lookout for a good used trailer that is larger then what we have. The used trailers in good condition that we are seeing around here are going for $3000 + and we really did not want to pay that much for one. Perusing Craigslist the other day, we came across this 12 ft. trailer. We haul more sheep than cattle and 12 foot would accommodate our bull or cow easily. The trailer was older, had rusted out sections and it was missing the floor but on the plus side it was a gooseneck, had dual axles and electric brakes. The seller was asking $450.00, so on a rainy Sunday morning we drove over an hour to check it out. I love these “treasure hunts” as they take us often to places we have not been before and we have met so many interesting people. Watching Boone when he is making deals is always fun. He really enjoys hearing folk’s stories and soon he and the seller were checking out each other’s hunting photos out on their phones and swapping tales. The seller was very motivated to get it out of his yard as it had been sitting there for a long time and his wife was on him about it so he let it go for $200. Score! We hooked it up and crossed our fingers that we would make it home with the trailer still in one piece. Figuring if one tire blew it had three more even if one was a size bigger than the others. There is a machine shop in our area so Boone got on the phone to them and discussed all that needed to be done to the trailer. In just a few days, the trailer was in their shop and getting overhauled. They took the top with racks off and made new sides. Boone went to the local lumber yard and bought rough cut lumber for the flooring. The machine shop installed it along with cattle paneling on top of it for traction. With the new sides installed, the top went back on. The gooseneck tongue was bent so it had to be reworked a bit. 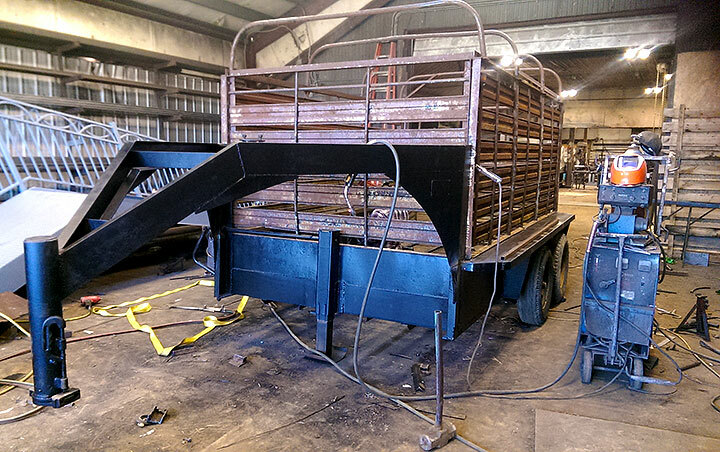 The machine shop wirebrushed and painted the trailer. Boone still has to rewire the trailer and get the new tires on. It has been raining so much the past few weeks that he has not had a chance to finish it up. I think we did really well. The trailer was missing the canvas top so I still need to get that. There is an Amish fellow not too far from us that makes them. Once it is completely done I will get the photos up. We are debating on whether to keep the little trailer or not. If we sell it we could probably get about $250.00 for it which would help offset the cost of the new stock trailer. 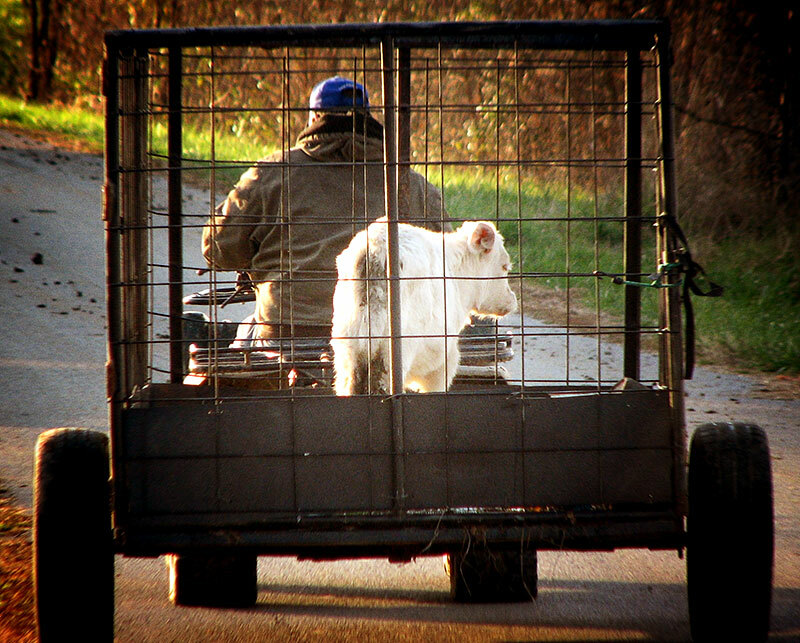 But, the little trailer is handy – we can easily tow it with the 4-wheeler which we have done more than once to move animals around the farm. So we’ll see.